Nobody likes to be spoiled, so we suggest you watch “The Woman Who Lived” before reading this review! One theme that keeps recurring on Doctor Who every so often is how the Doctor’s presence/actions/impact leaves its mark on people and places. Usually, the Doctor swoops in, saves the day, and leaves other people to deal with the aftermath on their own. That’s as it should be from a storytelling standpoint; that’s the mythical hero’s job. But, occasionally, we get to catch up with people who’ve met the Doctor and changed because of him, sometimes for the better, but not always. In Catherine Tregenna’s “The Woman Who Lived,” we get to see what happens when the Doctor saves someone’s life, makes them immortal, and then just leaves for several hundred years. Tregenna’s script has a sci-fi plot about a leonine creature from another dimension, as well as a MacGuffin in the form of an Ancient Greek amulet. However, the episode is really all about exploring what an immortal without a TARDIS would do with her life, and it’s not entirely a good thing. The titles of these two episodes are both literal and very metaphorically apt — Ashildr died, and the resulting person was Me. The girl died, and this is the woman who was left. The casting of Williams proved to be a stroke of genius even more so than before. While she portrayed a starry-eyed Viking girl with aplomb, it’s the un-aging yet impossibly old version of that same human that really allows the actress to show what she can do. What does an immortal do with all the time in the world? The answer, we find out, is become “superb.” She makes mention of the assertion that it takes 10,000 hours to become good at anything, but with 100,000 hours, you can virtually master anything, including holding one’s breath, firing arrows, speaking with a voice entirely too deep to actually exist inside her voice box, and it would appear a lot more. One of the most brilliant touches in the episode is to have walls and walls of journals, not unlike the Doctor’s bafflingly thin 2,000 Year Diary. Me’s journals contain all of her many, many adventures, which she reads because she can no longer remember herself. She tears out the pages containing painful memories, yet leaves the pages about burying her children to remind her not to have anymore. That’s utterly heartbreaking. We also find out that she’s never used the second immortality chip (essentially) that she was given by the Doctor, because, as she says, “nobody was good enough.” That’s a level of fear that we might comprehend but not understand. She didn’t even give it to her children, mostly because she wouldn’t wish her fate on anyone else. Humans may be Mayflies, but you get the sense that Lady Me envies them entirely, with their love of life and their ability to die. This is why the character of Sam Swift the Quick (Rufus Hound) is so integral, because he represents living life to the fullest, which Lady Me hasn’t done in probably 500 years. 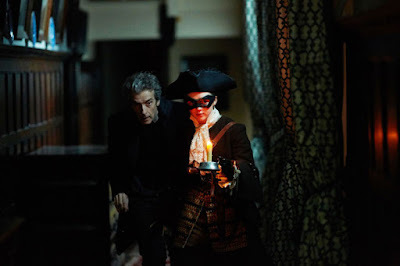 My favorite scenes in the whole episode are when Lady Me begs the Doctor to take her with him and he simply won’t, at first not saying anything and later saying “because it wouldn’t be good.” Naturally, for someone who has felt abandoned by this big hero, it leads her to turn entirely to work with the Lion Guy. However, we find out at the end of the episode that the reason he won’t take her with him is because being around other immortals makes one hardened; it has dulled the plight, the fragility, and the beauty of a finite life. This is why he travels with Clara (and has traveled with so many he’s lost) and this is why he hasn’t made her, or any of them immortal, which Lady Me asks him about. And Lady Me ultimately decides that her lot in life is to be there to clean up after the Doctor, to attend to the people he leaves behind as he swoops in and out of their lives. She’ll be in the background for all of the Doctor’s exploits — and will maybe meet Captain Jack Harkness one day? — to make sure he doesn’t do to them what he did to her. They aren’t enemies, but friends who have to make sure the other doesn’t do wrong. One of the best lines comes at the end when the Doctor says he’s glad he saved her life, and Me replies “Everyone will be.” Chilling, but also pretty badass. And, we once again have an allusion to Clara not being around forever. Anytime anyone says “I’m not going anywhere” in relation to a show where you already know the actor is leaving, it’s proooooobably not gonna continue much longer. But, that’ll be for another day, I expect. We’re officially halfway through Series 9 of Doctor Who and I think it might be one of the best series they’ve ever done. All six episodes have offered us a look at the Doctor in a way that the previous series really had not. 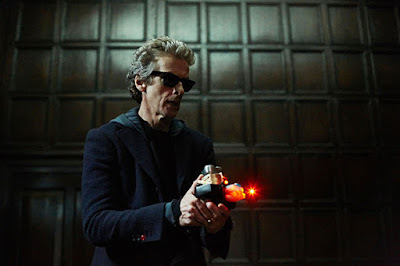 If Series 8 was about how the Doctor and his companion get along when they don’t see eye to eye, Series 9, so far at least, is about what it means to be the Doctor, the nature of being this 2,000-year-old Time Lord and the effect he has on the environment and the people with whom he interacts. Even though he’s been the main character since the beginning, the Doctor’s nature hasn’t been explored too much, and I’m loving it. Let Catherine Tregenna write more, because this episode rocked. Next week, we begin a two-part adventure (what?! Two parts?! Yes, again) about a Zygon invasion. Fittingly, the first episode is called “The Zygon Invasion”, written by Peter Harness who last year wrote the controversial “Kill the Moon.” Also, it looks like Osgood (Ingrid Oliver) is back, either meaning it takes place prior to “Death in Heaven” or it’ll be explained away by Zygon duplication. Regardless, I’m excited for it.